BOY, DO WE LOVE A NEW YEAR! The New Year comes with much fanfare and excitement—we’re joyful and full of hope that it will be better than the last. For those of us who had a nightmarish past year, we feel relief for the annual reset. as the screenwriter, star, director, and producer! Being locked in this cycle (until vacation time and then rise, rinse and repeat) can make it challenging to see true positives in our lives. Outside of milestones like getting that degree, falling in love, starting a family, winning a hard-earned promotion, and other major events that we use to measure our happiness levels, we generally rush past the little stuff that happens all the time. Add to that, the constant deluge of negativity that gushes out from our screens, contributing to the mental vise that squeezes one into a stress-machine, devoid of joy. Yes, the clock is ticking, it does feel as if time is accelerating, particularly since we spend a lot of it looking back to the past, or forward to a future we are either too fearsome of, or can’t wait until it arrives—and when it does, many times we are not happy with what comes or are disappointed because it’s not what we expected. OH MAN, HOW DO I CHANGE THE NAME OF MY MOVIE? A great way to change the narrative is in cultivating a Mindfulness Practice in which Gratitude is an integral piece of the foundation. A Mindfulness Practice really puts one in The Present Moment where being aware of the fact that we are co-creators in our existence enables us to make more conscious decisions and choices. The practice of Gratitude can serve to lighten many of the burdens we take on in our Life Journey, thus opening our eyes to the fact that we can in a lot of instances actually put some of those heavy boxes down or unpack them! Being gratefully aware will shift your mood, perspective and energy, as thoughts and feelings move the Emotional Geiger Counter toward center. Know or come into contact with someone who is always happy? So happy to the point you secretly want to slug them? If so, why does their joy aggravate you? If you don’t know anyone like that, why not? (you can become the first person you know!) And if you do know someone who effuses exuberance consistently, really listen to what they have to say, for you’d realize they tend to look to the brighter side and are really appreciative of the things that come their way, big or small. Our thoughts trigger hormones that can either support or hinder our well-being, so entertaining regular thoughts of gratitude is like giving yourself loving hugs. The endorphins that Grateful Thoughts send us are like “feel good” boosts. One great way is keeping what I call a ‘Gratlog,’ short for Gratitude Log or journal. A regular Gratlog shows you how many things are truly working in your favor and not to take things for granted like your home, the people in it or what we consider to be a given–the gift of breathing, being able to think, to feel; and the incredible miracle that is our bodies. By all means, note the big-ticket items but the Gratitude sweet spots are in the recognition of the small stuff, like getting to a destination on time despite the roadblocks that came up, or having a ‘chance’ occurrence take place that gives you a necessary link to a goal, to being the receiver of an unknown child’s smile that is beamed to you exclusively—these seemingly arbitrary happenings are worthy of your appreciation and awareness. I saw a video on social media where this toddler was going around hugging people at an outdoor event. Everyone was like ‘ohhhhh what a cutie’ but I wonder how many realized that child was choosing to hug them, for she did not hug everyone around her. That baby gave little pearls of love to everyone she hugged and to everyone who sees that video because we get a glimpse into pure beauty. 1-(See if you can) catch yourself complaining to someone and when you do, state one thing you are Grateful for and conjugate that thought into a convo. 2- When you catch yourself complaining to yourself, think of one thing you are truly Grateful for and spend a few moments reflecting. 3- Upon waking and before jumping out of bed, take a moment and think of something you are Grateful for take a deep breath in and a deeper one out. 4- If you grapple with insomnia, instead of getting aggravated about not being able to sleep, take slow and deep breaths thinking of what you are Grateful for, truly feel the Gratitude. Pay attention as well to your breathing, slow in, slower out. 5- When something doesn’t go your way, instead of griping about it immediately shift your focus to something that did go your way and that you are Grateful for it. 6- Even though writing in a Gratlog is a POWERFUL transformer, keeping a daily Gratitude Verbal Log (GVL) on your phone is da bomb diggedy!! Play it for yourself in the course of the day, particularly when you are dragging. As you receive inspiration from your Gratitude Practice, you will see and feel shifts in your energy and mood. You will inspire others. A new year will come and go with Gratitude for all that has transpired and for all that will occur, as everything that happens comes in the guise of a great teacher. 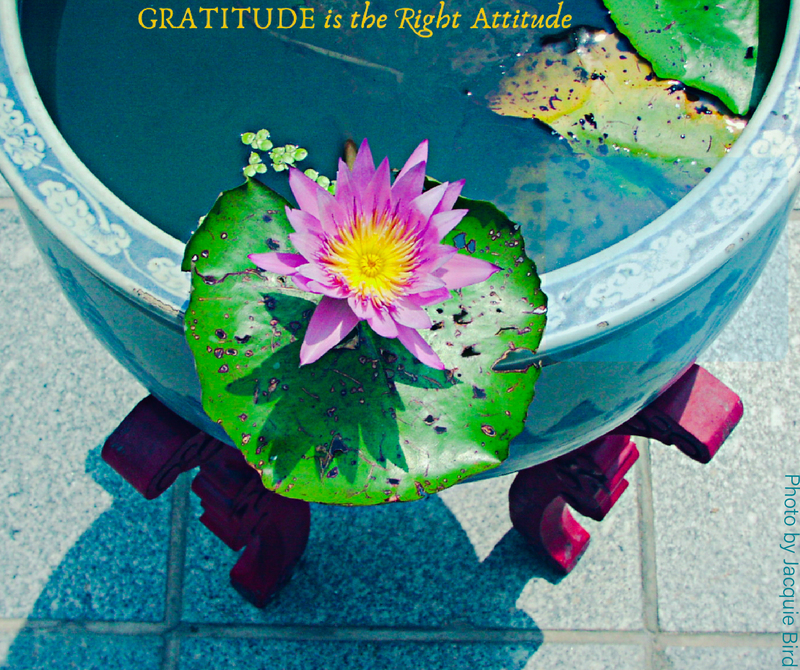 Gratitude helps us to become greater students, for Gratitude is the right Attitude now and always.